North Korea says it has carried out its first test of a nuclear weapon. It said the underground test, carried out in defiance of international warnings, was a success and had not resulted in any leak of radiation. The US said intelligence had detected a seismic event at a suspected test site and Russia said it was "100% certain" a nuclear test had occurred. The US said the reported test was a "provocative act", while China denounced it as "brazen". In an unusually strong statement against its ally, China expressed its "resolute opposition" to the claimed test and said it "defied the universal opposition of international society". Japan's Prime Minister Shinzo Abe called the claimed test "unpardonable" and said the region was "entering a new, dangerous nuclear age". The BBC's Jonathan Marcus says North Korea's claimed test does not necessarily mean it has a fully-fledged nuclear bomb or warhead that it can deliver to a target. Our correspondent says there will now be pressure on the UN Security Council to push for a resolution condemning North Korea and probably demanding a stiff menu of economic sanctions. US White House spokesman Tony Snow said: "We expect the UN Security Council to take immediate actions to respond to this unprovoked act." Mr Abe, who is in Seoul for a meeting with South Korean President Roh Moo-hyun, urged the council to take "undaunted" action. He said Japan and the US would step up co-operation on the missile defence system they began after a North Korean missile test in 1998. President Roh said the claimed test had created a "severe situation" that threatened stability in the region. He said Seoul would react "sternly and calmly". The South Korean military - which has been put on a heightened state of alert - had the capability to cope with any North Korean provocation, he said. Seoul also suspended a scheduled aid shipment of concrete to North Korea, the state news agency reported. The BBC's Rupert Wingfield-Hayes in Beijing says China's statement is an indication of how strongly it is angered by North Korea's action, although Beijing will still be loath to support tougher sanctions against Pyongyang. 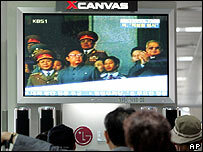 When it announced the test, KCNA described it as an "historic event that brought happiness to our military and people". It said the test would maintain "peace and stability" in the region and was "a great leap forward in the building of a great prosperous, powerful socialist nation". South Korea's Yonhap news agency reports that the test took place in Gilju in Hamgyong province at 1036 (0136 GMT). Russia's defence ministry said it was "100% certain" that an underground nuclear explosion had taken place, ITAR-Tass news agency reported. Japanese Foreign Minister Taro Aso said Japan had detected seismic waves, but could not confirm whether they were from a nuclear test. The Japanese and South Korean foreign ministers have held a telephone conference call with US Secretary of State Condoleezza Rice to discuss the issue, South Korea's foreign ministry said. The development comes three days after the UN Security Council agreed on a formal statement urging North Korea to cancel any planned nuclear test and return to disarmament talks. Pyongyang pulled out of the nuclear Non-Proliferation Treaty in 2003 and has refused for a year to attend talks aimed at ending its nuclear ambitions. The UN Security Council imposed an embargo on the import and export of missile-related materials in July after North Korea test-fired several missiles. If confirmed, the test would make North Korea the ninth country known to have nuclear weapons.